Faience Tuart Amulet: "Hippopotamus Goddess of Childbirth"
This amulet is from the 18th Dynasty or the time of King Tut (approximately 1400 BC). It was worn to protect women in childbirth. 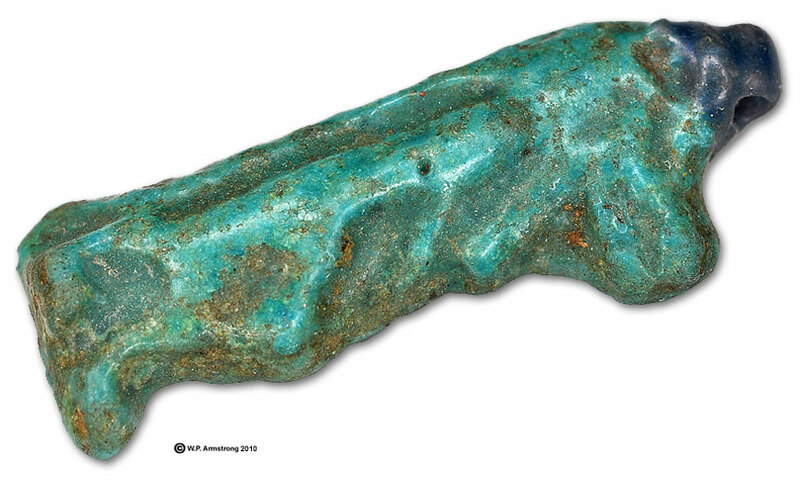 Egyptian faience is a non-clay based ceramic composed of crushed quartz or sand with small amounts of calcite lime, with a soda lime silica glaze of copper pigment to create a bright blue-green luster. Faience is the oldest man-made material used strictly for decorative and ritual objects. According to Foster (1979) and Moorey (1985), the earliest use of this material is conservatively dated back to 4500-4300 BC. Foster, K.P. 1979. Aegian Faience of the Bronz Age. Yale University Press, New Haven, Conn. 205 p.
Liu, Robert K. 2000. "Comparisons of Ancient Faience Ornaments." Ornament 23 (3): 56-61. Moorey, P.R.S. 1985. "Materials and Manufacture in Ancient Mesopotamia: The Evidence of Archaeology and Art. Metals and Metalwork, Glazed Materials and Glass." BAR International Series 237: 302 p.